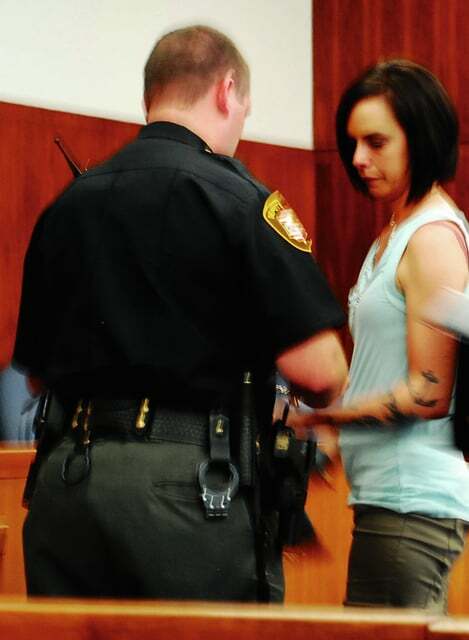 Heather D. Gaus is taken into custody following a sentencing hearing Tuesday. Gaus previously pleaded guilty to theft for deceiving community residents into thinking she had cancer and receiving money from the hoax. A woman who received money by purporting that she had cancer was sentenced to prison Tuesday. 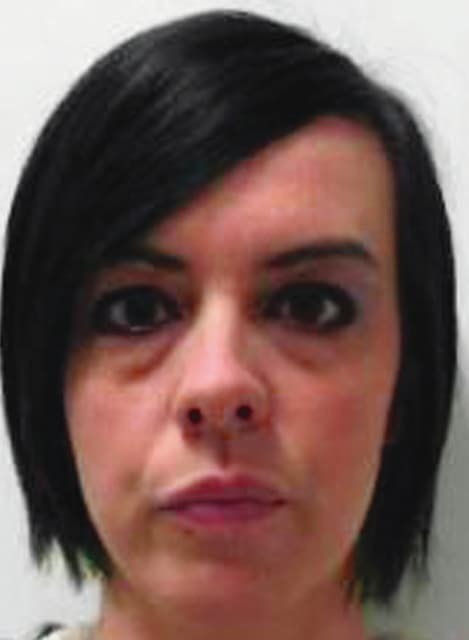 Heather D. Gaus, 34, was sentenced to one year in prison and ordered to pay $3,266.96 in restitution to more than 25 victims from whom she received money. Gaus was indicted in May for theft and receiving stolen property for conduct that occurred between Jan. 1, 2013, and Dec. 31, 2013. She pleaded guilty to theft, a fifth degree felony, last month. The grand jury indictment states Gaus deprived the Fraternal Order of Eagles and additional donors of money donated or paid for her benefit due to her representations that she had cancer. Donors included people donating through the website youcaring.com, where a site was established for her benefit. When the site was still accessible, it claimed that Gaus was diagnosed with a form of brain cancer and stated $1,045 of a $3,000 goal was raised. Champaign County Prosecutor Kevin Talebi said virtually everyone knows someone affected by cancer in some manner and Gaus’ case was difficult for the victims because of a betrayal of their trust and generosity. Talebi said because of the work of his office and the Champaign County Sheriff’s Office, the state identified 31 victims who donated to Gaus. Throughout the hearing Champaign County Common Pleas Judge Nick Selvaggio questioned Gaus about her motives and how she continued to portray that she had cancer to the community and her family over an extended period. Gaus said the hoax started when she told an ex-boyfriend that she had cancer because she wanted attention. As she continued to explain her conduct, Gaus stated she shaved her head and appeared at a fundraising event the Fraternal Order of Eagles hosted for her. Gaus said she continued to lie to family including her children, telling them she was going to doctor appointments or surgeries and at one point told them she expected to die. Gaus said the hoax ended after her ex-boyfriend told authorities once the relationship ended. Prior to handing down the sentence, Selvaggio compared the attention the 2003 criminal case of Teresa Milbrandt received against how common cancer hoax crimes are today. Milbrandt received thousands of dollars in donations after saying her daughter had cancer in the 2003 case. Selvaggio said prior to the hearing he did a Google search on the term “cancer hoax” resulting in 1.18 million responses. Selvaggio said Champaign County is a giving and responsive community that will continue to trust people. He provided examples of this trust by referencing recent articles featured in the Daily Citizen about community events to help benefit families and victims of different diseases. Along with theft, Selvaggio said the court took into consideration the impact the conduct had on Gaus’ children, the longevity and nature of the deception, and age of the children as major factors. He said Gaus failed to abide by her parental responsibilities to the detriment of her children. During the hearing, Angie Zimmerman spoke as a victim representative on behalf Gaus’ children. Zimmerman told Gaus that she did not meet the definition of a mother. “You are supposed to be the protector of your children, but it appears to me they need to be protected from you,” Zimmerman said. At the conclusion of the hearing, Gaus’ attorney, Ryan Reed, asked the court for a stay of the sentence pending an appeal. This motion was denied. Upon her release, Gaus is subject to post release control for a period of up to three years. Nick Walton can be reached at 937-652-1331 Ext. 1777 or on Twitter @UDCWalton.